KEL 728 is a Bristol KSW6B new to Hants & Dorset in 1951. The ECW body was of the L55R variety when new. 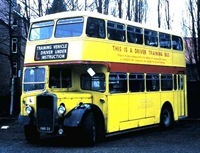 After withdrawal from passenger duty in 1969, it became one of the driver training fleet, with various alterations including the fitting of a sliding door and the replacement of most seats by concrete blocks. This was to simulate ‘loaded’ condition. We see it still in Tilling green and cream but with NBC fleetname in Grosvenor Square during the lunch break one day in August 1975. Shame cant see the registration of the coach behind. Wondered if it was H and D or Shamrock and Rambler. It was one of the ORU …G group, so H&D, but don’t ask me which one of the three! Living in Southampton as a schoolboy in the fifties, the Bristol engined Ks were familiar and friendly vehicles in the area. The KSW like 1285 was one of my favourite marques. 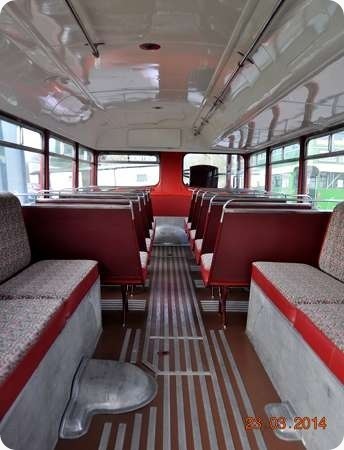 The extra width, the style and finish of the interior trim had an edge (in my view) over other contemporary buses and maintained a brighter environment when compared to its successor, the Lodekka. This vehicle was the first of the lowbridge KSWs delivered to H & D and all fourteen were allocated for the bulk of their lives to Southampton or Fareham depots. In the final years most migrated to Bournemouth and Poole, where they still maintained an elegant presence in the ‘Pines Territory’. My final journey on this type was on 1294 in November 1970 on a service from Bournemouth to Wimborne. Happy days! About 30 years ago a letter appeared in Buses Illustrated commiserating with the hapless drivers of Bristols and comparing their lot with that of those lucky folk who drove London buses. The writer suggested that you don’t so much drive a Bristol as wrestle with it and finish your shift in utter exhaustion. As a teenage enthusiast I found the ubiquitous KSWs and LDs uninteresting but a short spell of driving for Thames Valley in 1968 taught me what superbly designed vehicles they were. What an indignity for KEL 728, having to carry concrete blocks around! For my last 12 weeks RAF National Service (Jan-Mar 1959), I was posted to RAF Calshot, my mother living in Southsea. On Mondays, I’d take a trolleybus to Hilsea, a Southdown 45A which terminated at Fareham Bus Station, then the 77 H&D Bristol to Warsash service, then getting an air-sea rescue launch over Southampton Water to Calshot. The Bristol would have been in the yard all night and freezing cold, with frost inside the front windows needing to be scraped off! Arrival at our Calshot office necessitated laying the free-standing coke stove and getting it going before work started. It was noon before I’d really warmed up! The return journey on Fridays usually involved the Southdown 45 route which went all the way from Warsash to Southsea. So Fareham to Warsash was a shared route, with Southdown at its Westerly extremity at Warsash and Fareham being H&D’s Easterly extremity. Southdown usually put on PD2’s or Guy Arabs, but I seem to recall one Queen Mary, overkill for the route. But H&D had these KSW’s usually, which seemed quite civilised as I recall. It’s fair to say that these dozen trips on a Bristol bus constitute about a quarter of all rides I’ve ever taken on a Bristol in normal service! Fareham was not quite the easterly extremity of Hants & Dorset, Chris. During the three years I spent at Alverstoke (1949-52) my mother and I sometimes used to catch the Hants & Dorset service from Gosport (marginally farther east) to Lee-on-Solent or Tichfield and Southampton. The buses were Bristol K types back then, of course, probably K5Gs. As a very happy conductor and driver with Samuel Ledgard at Otley and Ilkley depots I regularly regretted that I would never drive a Bristol vehicle. However one morning I had to pinch myself as I reported to the garage to operate the 0807 duplicate from Otley to Leeds and back. Parked near the bus station with "Harrogate via Otley" on the destination blind was K6B KHY 746 (ex Bristol) – yes, it had suffered a front wheel puncture a few minutes earlier and had been replaced by one of our Otley vehicles. With fingers crossed I approached the output man for my bus to be told "You’ll have to take that 746 outside." Well, what an utter delight the vehicle was in every way – the gears were like silk, the brakes smooth and superb, visibility great, and the Bristol AVW engine enabled it to ascend the two mile long A660 in fine style. When we got to Leeds the disgruntled and totally disinterested young conductor came to the cab and said "I don’t know what you’re getting excited about, its only a b***** bus." So naturally I fully agree with everything that Ian Thompson says in favour of the model even though "mine" was slightly earlier and "thinner" – the pedigree was the same !! Geography and popular opinions of places’ locations do contradict each other sometimes. Chris Hebbron comments on his trips to RAF Calshot. One might think that, being on the western side of Southampton Water, it is west of Southampton. Certainly, buses head westwards out of Southampton towards Totton, Marchwood, Hythe, Fawley and Calshot, but Calshot Castle is actually due south of the mouth of the Hamble, east of Southampton. Roger Cox mentions his time at Alverstoke which, although many of the present residents refuse to acknowledge it, is actually in Gosport and east of Fareham. A strange situation applies at Fareham, which used to have two signal boxes. ‘East box’, being nearer to Waterloo on the original line through Basingstoke and Winchester, was actually WEST of ‘West box’ which was further away from Waterloo. I have some American Railroad DVDs in my collection, with maps. The commentary mentions ‘compass west’ which is the actual direction of travel, and ‘timetable west’ which is the nominal direction. What fun! One summer in the mid to late ‘sixties I remember my Dad, a West Yorkshire driver, saying that he had performed a duplicate on the 84 Harrogate-York-Scarborough service. His trusty steed was an ‘SBW’ (Bristol LWL6B/ECW B39R) and I’d assumed he would have been disappointed at the prospect of having to drive such an ‘old’ bus, heading up towards it’s retirement, over such a distance. (What shameful thoughts Brendan, even for a early teenager!). Well Dad said much the same as Ian and Chris (Y) have done and relished the experience. I recall him saying how light the steering and clutch were, and that the gearbox combined with the Bristol AVW engine worked a treat. All in all an enjoyable day out by the sound of it. Just wish I’d been along for the ride. Brendan – I can well appreciate your Dad’s delight with the SBW. Although as an Ilkley depot conductor I never drove one I consider the SBWs to be the very finest examples of the wonderful ECW postwar "L" variants. Not only were they supremely handsome and "tidy", but within there could never have been anything finer – wide gangways, useful luggage racks, excellent stairs and sliding doors, good visibility, and easy passenger flow even with standing customers – that barmy over the top trendy term means passengers, customers patronise shops !! 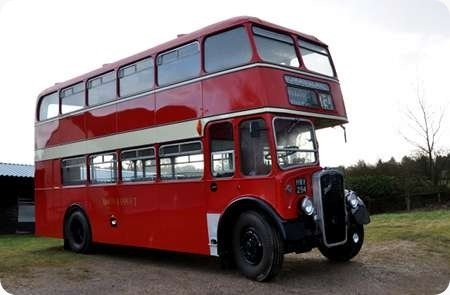 At Ilkley we had EB2/3 (31 seat luxury), SGL 14 (slim) and SBW 17/26/33. Agreed Chris Y! A colleague used to define the difference this way (in connection with the railway industry): Passengers travel; Customers merely pay. Chris and Stephen, bus drivers may be told by their employers to see passengers as ‘customers’ nowadays in order to promote real ‘customer service’. However, how many times do we see these same ‘customers’ treated with disdain, not by the drivers, but by the employers who cover the windows with Contravision, or vinyl promotional stickers and overlays, so that the allegedly all-important ‘customers’ cannot see out? ‘First still seems to be Worst’ in this regard, but sadly there are others out there. Thomas Tilling will be turning in his grave – if not already spinning like a starter motor. Absolutely spot on Brendan. As is widely known, I ‘m in total despair these days at all the marketing, route branding, swooping "playschool" liveries etc – 99% plus of which goes right over the heads of the travelling public or simply understandably confuses them, and costs unimaginable amounts of money When will operators realise that all the Public want is a clean smart bus at the right time at a sensible fare. Now, where did I put that tin helmet?? I’m sure I got it back from refurbishment not long ago !! Thx, Roger, for making me aware of back-door H&D route to Gosport. 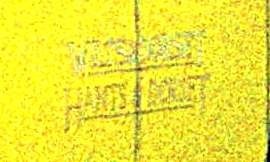 I confess that on the few times I used to go over to Gosport, I never saw saw an H&D bus/bus stop to raise my curiosity! Hants & Dorset did have a presence in Gosport, though. On the occasions when I travelled across the water (or took the long way round via Fareham), there was often an H&D Bristol K lurking against a wall behind the Provincial line up at the bus stands. I don’t recall if it displayed any route number or destination, but my impression at the time was that it was parked up for later use. As the Provincial fleet had my stronger interest, I didn’t take so much notice of it! I don’t know whether when it came to service, it drew up on one of the Provincial stands, or whether it went somewhere else to begin it’s journey. H&D ran several services to Gosport. The 70 and 93 ran from Southampton, each one hourly. The 70 was converted to OPO and became limited stop as X70 around the time the last REs (XLJ725/6K) were delivered. As far as I recall there were other local services, including an indirect service from Fareham. The construction for an embryonic new resort (intended to rival Bournemouth) given the supposedly prestigious name of Lee-on-the-Solent began in 1885 and proceeded apace. A pier was completed in 1888 and a light railway line (maximum permitted speed – 25 mph) was built in 1894 to connect with the Gosport/Stokes Bay main line at Fort Brockhurst on the western fringe of Gosport. In 1910 Provincial Tramways began operating connecting services with its tram operations from Bury Cross and Brockhurst into Lee, but these stopped during the First World War. (The railway services to Stokes Bay and the Isle of Wight also ceased in 1915, never to resume). The overambitious original scheme for Lee-on-the-Solent was never realised and public transport revenues on bus and rail services were poor. Provincial lost interest in Lee as a traffic objective and the railway, too, entered a period of terminal decline. It was Hants & Dorset who stepped in with viable bus links through Lee to Gosport and Southampton, and I understand that these still exist, though the vehicles when I last travelled on the route were attired in the absurd Barbie apparel. Hants & Dorset had an outstation at Gosport – in the early post-war period at Little Beach Road, and from the mid 1950s until early 1970s in Harbour Road (just off the A32 Mumby Road, north of the High Street), where there was a small waiting room as well as parking space. There were ‘local’ services to Hill Head, Lee-on-Solent, Heathfield and HMS Aerial, together with Gosport to Fareham via Rowner (79) and 3 routes from Gosport to Southampton 70 and 93 (both via Lee-on-Solent and Bursledon) and 76 (via Fareham and Botley). Hants and Doret had acquired the operations of independent, Tutt, in 1924 to which were others were – which formed the basis of the H&D services in the Gosport area. Here is a picture of another KSW6B of similar vintage to KEL 728, but operated by the neighbouring company of Thames Valley. GJB 275, fleet no. 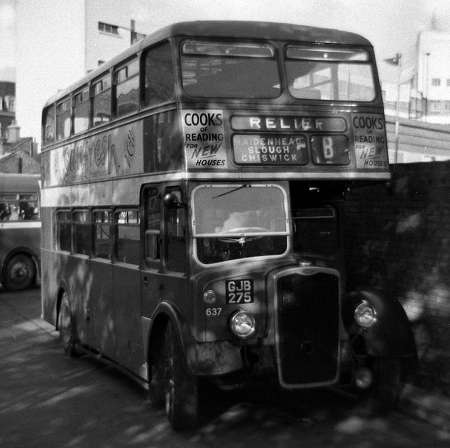 637, was also a 1951 vehicle, but differed in being equipped with a “coach” CL27/26RD body with platform doors. 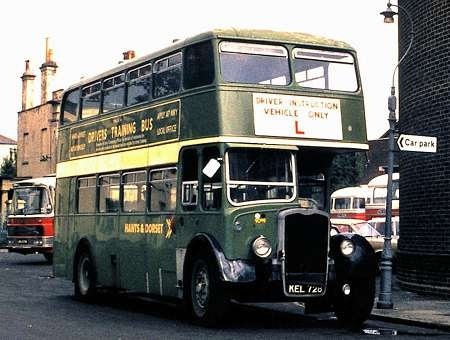 Thames Valley had nine of these buses for the Reading-London service ‘B’, though, because the route was covered by Green Line 704 and 705 between London and Slough, pick up and set down restrictions applied over that section. All the early production KSWs had either the Gardner 5LW or the alternative Bristol AVW of 8.1 litres supposedly developing the magic figure of 100 bhp that was often optimistically claimed by manufacturers in the early post war period – Leyland, Crossley and Daimler were others, together with Dennis, though the Guildford claim was accurate. The AVW was a basically sound dry liner engine manufactured also in horizontal form, unlike the troublesome wet liner BVW 8.9 litre design that succeeded it. The KSW6G did not become available until 1952 with the ‘K’ version of the 6LW yielding a genuine 112 bhp. Were there initially some behind the scenes pressures on Tilling Group companies to accept the Bristol six cylinder engine to reduce production costs and free the manufacturer to some extent from the constraints of Gardner supplies? The Thames Valley “coach” KSWs ran on the ‘B’ service for many years, latterly as relief vehicles, and GJB 275 is pictured in Victoria Coach Station on such duties in the summer of 1960. One wonders how a lowbridge bus of this type would be received by the ‘discerning customers’ on such a lengthy route today, though I, for one, would jump at the opportunity. I remember taking a bus similar to this model from Romsey to Southampton on Route number 63. In the late 1960s, all the buses that ran to and from Romsey used to terminate or start their routes actually from Romsey Town Centre, this was before the Romsey bus station was even built, the sight formally having been occupied by the old Jam factory. I can remember that there were several routes operated by Hants and Dorset, and one of these was shared with Wilts and Dorset. Whilst single decker’s ran the routs 60 Braishfield to Southampton ( via Romsey, Ower, Totton, Millbrook. ) Route 66 Romsey to Winchester and then back and then ran Romsey to Salisbury via West Wellow, Shootash. This service was the shared route as you either got a Hants & Dorset or Wilts & Dorset bus in either direction. The 65 went to Eastleigh via North Badesley, and the original Castle Lane. The 65 was run by both single and double deck vehicles. The number 61, 62, 63 all ran Romsey to Southampton. One via Upton Crescent Rownhams and Nursling, Shirley and Southampton. 62 Romsey to North Baddesley Rownhams Lane, Horns Inn Nursling, Shirley, Southampton and the 63 Romsey North baddesley, Chilworth, Inner Avenue, thence into Southampton. The 64 route ran Shootash and also served a number of the local villages, this was always a single deck service. Hants and Dorset and Wilts and Dorset drivers were some real characters, very friendly and helpful. I remember two particular drivers who did long service on some of these routes. Geoff Whitfield being one of these people. There was also a older chap called Stan. Didn’t ever know his last name, and it wasn’t Butler! but he was a character that made travelling on these routes a pleasure, and a lot of fun. Pity we don’t have these routes now. HWV 294 is a Bristol KSW5G dating from 1952 [like the photographer] and has been fully restored by Roger Burdett internally, externally and mechanically. It will be at various rallies in 2014. It has a L27/28R ECW body and was new to Wilts and Dorset as their 365. If anyone has more information or dates as to it use between it’s withdrawal and now please do not hesitate to leave a comment. The restoration was completed in March 2014. Odd how with the passage of time you learn to see things differently. As a young enthusiast 50-odd years ago, on the lookout for surviving prewar stuff and always drawn to fleets where scarcely any two vehicles were alike (the storeman’s nightmare) I used to think: "Oh, no! Not another Bristol! Can’t we have a bit of variety?" In my short spell at Thames Valley I came to realise that the KSW was one of the great classics of all time, which fully deserved its ubiquity, so many thanks to Roger Burdett for this fine restoration. Looking forward to a ride! Will she be at Warminster? Keep us posted, Roger! I think I would agree, Ian. The KSW was a classic – but I preferred the less common highbridge version; Lincolnshire and United in particular. This was also the same body as Sheffield’s B & C fleet PD2s. I was ambivalent about the tin fronts but erred on the side of exposed radiators. A KSW against a Sheffield PD2? The exposed radiator KSW any time. It was meant to make it’s first public appearance at The Quorn Rally last Saturday. I was one of those on board when it left Roger’s place to pick up others at Birmingham International, and then onto the M42 where the front offside tyre went before you can say I like Bristols. We had to wait for a following BMMO S15 to come to the rescue and Roger had to wait with the bus for a recovery vehicle. He hopes to have everything sorted so that it appears at the Taunton Rally on May 11th. Thanks for pointing out the ECW-bodied PD2s to me, David. I was completely unaware of them! Very handsome machines. If only one had survived… Forgot in my previous comment to thank Ken for these fine shots—especially the interior one. Two superb pictures of a gloriously restored classic vehicle – takes me back happily to 1951, when four such vehicles positively stunned us all with admiration when West Yorkshire RCC treated us to the allocation at "Lil’ old Ilkley depot." 806 – 809, later becoming DBW 1 – 4, and returning briefly to ECW to be retrofitted with platform doors – long before "retrofitted" became an "in" word. Now Boris, why didn’t you order a few hundred of these eh ????????. Here is a view of HMR 59, a Bristol KSW5G with ECW bodywork. By the time of this view, the 1952 vehicle had been relegated to training duties. She’s seen in the yard of the Hants & Dorset depot in Southampton, in March 1975. By this time, NBC amalgamations were in full swing, and the Wilts & Dorset fleet name was soon to disappear. The view is of particular interest in that both fleet names appear, in Tilling style, on the side. I well remember the changeover to Hants and Dorset in the Salisbury area. A typical NBC waste of money. Everyone I knew always said they were travelling on "the Wilts". Under different management we have W&D back but in the Salisbury area they call themselves "Reds" and in Poole/ Bournemouth they are known as "More". Goodness knows what this is supposed to mean. I know what you mean about names. locally we have buses run by ‘Et Cetera’ in the Chobham area. It sounds like they were an afterthought! Whatever is wrong with good old-fashioned no-nonsense titles, that did what it said on the tin? Grahame. I think you’ll find that the outfit you are talking about is the illiterate ExCetera – from Croydon – who seem to be cleaning up in Surrey at the moment. Living in Ottershaw, I am often in and around Chobham but have not seen them in service there yet. Working regularly around Croydon, I have seen quite a lot of them – and in the intervening territory. Thank you for the correction. I also live in Ottershaw (26 years now) so we may have crossed paths at some point. I have seen the ‘Ex Cetera’ brand name on the Chobham-Woking route but there are no doubt others, as you say. I was in Guildford yesterday and there was a Buses Excetera vehicle passing me. There also appears to be a Coaches Excetera arm as well, the website not only giving a London Phone contact number, but also a Milan one! they do seem to cover the Croydon Epsom, Guildford corridor. Chris. I believe the coaches arm came first but I also suspect that it was a pre-existing company known by another name. FWIW, I read on the web that the Excetera came out of Croydon Coaches, but when I rang the latter, I was told that the Excetera had come out of EPI Coaches, also of Croydon and London. As a Croydonian whose wife comes from Guildford, and who spent many formative years in the bus industry at Reigate with LT(CB&C) and LCBS, and at Aldershot with the "Tracco", together with years of moonlighting with Tillingbourne and North Downs, I prefer to remember the bus network in those parts as it was before the devastating Black Death known as Deregulation. Nowadays, whole swathes of industry, not just transport, are besotted with ‘rebranding’, for which they surrender stupendous sums to shiny suited simpletons in the "marketing" sector, and, in return, receive offerings of extreme absurdity that appear to emanate from the ludicrous world of Edward Lear. Grahame asks why things cannot now do what they say on the tin. Sadly, and increasingly, they often do – the tin has very little in it. Public service is now so shaky that one concludes it must be a punishable offence. I worked in Guildford, early ’60’s, working at Bridge House (long gone), by the station. We nicknamed it Bridge House over the River Wey! I’ve visited the town periodically over the years (wife grew up in Woking). I also seem to recall Safeguard, too. Also, an LT presence, with GS’s and RLH’s at Onslow Street. Is it still there? Roger, having spent many years involved with marketing from both sides of the fence, as it were, I can’t let your remarks on "shiny suited simpletons" pass without comment. Marketing – as opposed to sales, is a very tenuous art, perhaps even a dark art. Over nearly 50 years I’ve seen it evolve (or should that be dissolve) from a tool to solidly position products and services in the mind of the buyer to a cure all for poor management decisions, badly thought out products and lack of understanding of the needs of the potential market. Unfortunately water finds its own level and if you are running a marketing company, an ad agency or a design house and you find that poorly conceived ideas are just as much accepted and command just as much income as those which take real thought, testing and development, the tendency is to take the line of least resistance. Equally to blame as poor managers who are prepared to accept lazy or shoody marketing are the purchasers of the products and services so presented. There seems to be a trend in these islands where, as long as the product is cheap enough, doesn’t take effort to access or is perceived to be offered by a large enough institution, people take a laissez faire attitude. Just look at some of the very poor, banal and often totally irrelevant product advertising on TV. What sort of management allows an ad with a strap line "92% of 121 women agree". More to the point, what sort of end user accepts such rubbish and even makes a purchasing decision on such an ad? Unfortunately far too many. This attitude extands into far more important matters: banks, for instance who change their terms and conditions at will to their benefit yet, if you as the other party to the contract want to make changes, you are told you can’t. Then the same bank will run an ad supported marketing campaign praising its customer friendly attitude and encouraging you to discuss your finances "in branch" – YUK! So, don’t blame those who provide the tools for such mediocrity, they are just trying to make a living and responding to the feedback they get from those that buy their services. That attitude may be morally bankrupt but morality in business can be a sure fire way to bankruptcy. Policemen may indeed look younger but this retired one didn’t when he looked in the mirror this morning! The country must be getting very dangerous as all the coppers go about in pairs. Some of them look so young I am tempted to say to them what the Colonel said to the young officer in Dad’s Army "Haven’t you got a comic to read boy?" Seriously though they do a difficult job and in my experience it has always been a case of Lions led by Donkeys which also sums up much of our dear old country today. Back to the posting. I do miss the sight and sound of Bristols trundling round the streets of Salisbury. Thx for the update, Roger. So another town has been partially spoiled in the name of progress. You mention Guildford being thought of as a city, but many thought it the county town, too. Maybe it is now, with Kingston being lost to Greater London! Damn Edward Heath for his county medddling! I do know that Woking, a pleasant enough town in the 1970’s, is really ruined these days! But I digress. Phil, I accept all your comments on the matter of marketing. Ultimately, the client has to bear the blame for accepting trashy publicity and absurdly exaggerated product description. I, too, have gazed upon television advertising in bewilderment as product promotion soars to stratospheric heights of improbability and idiocy. You will have a better knowledge than I of the costs of each individual form of media advertising, but, when a telly advert screeches on for several minutes at outrageous cost without giving a clue to its ultimate product USP, then one wonders what measure of expenditure control is exerted at the client company. Branding has become a particular nonsense, and one suspects that some of the smaller clients are being bamboozled by professional marketeers into accepting names that belong more in a Doctor Who script or a Tolkien novel than in the real world of product placement. Sententious twaddle infects almost everything we see around us nowadays. The guy across the road works for the local housing association, which has adopted the utterly meaningless moniker "Luminus" (serves ’em right that it is usually referred to as "Loony Mouse"). His van bears the utterly vacuous slogan, "Demonstrating a more excellent way of doing business". Quite apart from the uselessness of this blurb – the van isn’t demonstrating anything – whoever thought that up knows nothing of English grammar; you cannot have varying degrees of excellence – it is an absolute. Yet we see this sort of gibberish in advertising all around us now. End of my rant. I must press a cold flannel to my forehead. I must sound like King Lear screaming into the face of the storm. Kingston is still the County Town following the failure to decamp to Woking a year or two back. Despite the abomination that is the "Friary area", Guildford is still a "nice town" in other parts of the centre – that cannot be said of Woking which has an even worse "bus station" (the road outside the railway station). As a pilcock, sorry pillar, of the Church of England, for many years I was under the illusion that a Cathedral imposed city status on a town. I was only disabused of this quite recently. There is at least one plaque on Guildford High Street extolling the virtues of the City of Guildford. Well, it would be better than some recently ennobled towns! Roger, in explaining the evolution and descent of much of marketing into mediocrity I failed to mention that, like you, I rage against such rubbish. Another nonsense, foisted on us "for our protection", is the Data Protection Act. Example: talking on the phone to a UK government department this week I told the person on the phone at the start of the conversation that, after speaking to me, my wife had a query and I would pass the phone to her. During both conversations it must have become evident we were in the same room, that we have been married 42 years and that were exchanging comments to check information asked of both of us. My wife then asked a particular question which would have involved the person on the phone divulging information about me. This was 20 minutes into the call. She had to pass the phone to me so I could give permission for the question to be answered. Total b****y nonsense. Back to buses. The rear doors on the KSW, whilst no doubt a welcome addition for conductor and passengers, spoil the look of the vehicle. The width of the short bay and the jack knife doors are too similar making the rear of the lower deck look unbalanced compared to the rest of the well proportioned design. Well, this view has invited some interesting comments, has it not!!!!!! How a County Town can be other than in it’s ‘home’ County is beyond me. One of the early forms of Local Government Reogranisation – one of the rejected ones – was suggesting that Lancaster should leave Lancashire and go into Westmorland! County Town isn’t always the administrative centre of the County Council, of course – Appleby was the County town of Westmorland, but Kendal was the Admin centre. At least they are/were in the same County! Blackburn is another Cathedral town, but it isn’t a "City". I’m not too sure about Arundel . . . Chelmsford is another place that has long been considered a City – the local football club even has that name – but it was ‘elevated’ last year as part of the Golden Jubilee. 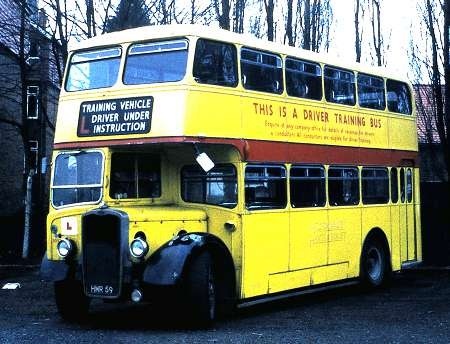 I like the way it says ‘This is a Driver Training Bus…..’ on the side, and on the front it shows ‘Training Vehicle’. It always rankled me when Yorkshire Rider boldly proclaimed our training buses to be Driver Training Units. Units ? They weren’t learning to drive a Unit – it was a bus for goodness sake ! They didn’t change their name to FirstUnit. Don’t give Wirst Bus ideas, John. Arundel is different, Pete – it’s a Roman Catholic Cathedral and never in the same mix of cathedral/city arguments. The County Hall for Surrey is still in Kingston, though that town is now within a London Borough, having been annexed by the GLC in 1965. I think that this situation is unique, unless, of course, someone on the OBP knows different (and I bet that proves to be the case). It does seem remarkable that Surrey CC has been unable to find suitable premises for relocation in 48 years. It may be unique at county level, Roger, but certainly not at lower levels. The offices of North East Derbyshire District Council are within the Borough of Chesterfield, and when I lived in Newport in 1969 I was surprised to find the offices of Magor and St Mellons Rural(?) District Council there. In both these cases, however, the offices are/were geographically central to the strangely-shaped administrative area, despite being located outside it! Two examples of ‘market-speak’ that irritate are ‘logistics’ and ‘solutions’. Haven’t the foggiest idea what either looks like, but there seem to be increasing numbers of trucks (logistics) and vans (solutions) carrying such items nationally. Presumably solutions are smaller or lighter than logistics. Whatever happened to the good old no nonsense word ‘haulage?’ As we know, in the bus and coach industry much heritage has been lost with the demise of such appendages as Traction, Automobile, Road Car, Motor Services, Omnibus etc. These titles of character and distinction have sadly been brushed aside in favour of the bland term ‘Travel’, or such corporate regional suffixes as ‘SouthEast’ and ‘The Shires’. Wonder how long it will be before a certain design and marketing consultancy will have us believe that bus operators are no longer bus operators, but actually ‘providers of local mass travel solutions’. The word you need Brendan is "transit". I’m sure Google used to use this on their travel directions, but it now says "Public Transport" presumably because people thought that was a route for white vans seeking logistics solutions. Logistics means we have GPS and know which layby you’re holed up in: solutions means we go very fast so the thing you forgot to send will still arrive. In a similar vein, have you noticed that new roads are always named "Way" – never road, street, lane, avenue, drive, crescent or (a special Nottingham favourite this) Boulevard. On the topic of logistics, the use of the word by transport companies is legitimate where you are dealing with certain types of haulage. Without getting too technical or digressing too far, logistics is the art or science (a bit of both really) of ensuring goods, equipment or personnel arrive where they are required, only when required and are fit to be used/take up their role on arrival. Originally a military concept, it has been applied to the shipment of critical items around the world using multi-modal transport, often through specialised hubs and can see an item in the course of its journey being transported by road air and water. There are specialists in areas from Formula One to oil rig equipment but the most well known true logistics companies are FedEx, DHL, UPS and TNT who, apart from transporting packages have worldwide contracts to move sensitive equipment and data for major corporations and governments in a way that ordinary post and parcel handling would not offer. Industry’s demand for continual production without the need to hold large stocks of components spawned the idea of "Just In Time Delivery" which created the need for much of the logistical planning that goes into haulage today. Even the delivery of greengrocery to your local supermarket from the point of origin in, say, Kenya or the Caribbean in a state where it is fresh, has a reasonable shelf life and can be consumed days after purchase, is far more complex today than just haulage from point A to point B. Once upon a time, when the universe was young, and a long lost language called English was spoken in the land, the term ‘logistics’ meant either a branch of mathematics, or the planned organisation of troops, armaments, supplies and transport for an advancing or retreating army. Transport, or as it is now seemingly forever to be known, ‘transportation’, is just one element in the complex package that constitutes logistics. The people that carry goods in vehicles from A to B are simply hauliers, whatever nonsense they choose to display on their lorries (though even these things are now to be called ‘trucks’). Taking up Brendan’s point, I think that the solution for mass travel must surely be the water on which a passenger carrying ferry or canal barge floats. In a world blighted by pretentious marketing piffle, the solution that we all need is a return to the language of Shakespeare and Doctor Johnson. I am not holding my breath. I always thought that TNT meant Tomorrow Not Today. Thanks Joe, I think you are right about transit – it flows much better than travel in the ‘strapline’ (now there’s another new word to conjure with!). Thank you too Phil for your comments as to the true meaning of logistics. As you state, the modern art of ‘just in time delivery’ is much more involved than traditional haulage, and there does appear to be a big difference between the two. However, the waters are muddied by the pretentions of some operators whose vehicles carry the ‘logistics’ title, when they should really be proudly displaying the word ‘haulage’ instead. Brendan, you are correct about the pretentions of some hauliers. Strap line is hardly new. Originating in newspapers it describes a secondary headline or caption and Dickens, as a newspaper editor, certainly knew the term. It was adopted by the advertising industry in the early part of the 20th century. Phil, going back to your comment about the KSW’s platform doors, I think ECW may have been dabbling with improving the design at some point. Early KS/KSWs originally had the quarter bay ahead of the entrance panelled over, but on later models the quarter bay was glazed. In either case, with an open platform the design looked balanced as you say. However, with platform doors fitted and closed, if the bay was panelled, a ‘thick pillar’ effect resulted between the fourth bay and the first door glass. If the quarter bay was glazed, the result was the ‘three window’ effect you describe. The same thing affected the LD Lodekka when fitted with platform doors. However, both it must be admitted were still very handsome designs. In order to ensure perfect nearside balance on either model, I suppose the only answer would be to leave the platform doors open at all times! A piece of totally useless trivia for you, Stephen, and nothing what so ever to do with the original subject. It would take far too long to list them all, but within historical boudaries of the City of London, you will find Squares and Alley’s, names ending in Lane – Side – Gate – Wall – Street Etc, and single words such as Barbican – Eastcheap – Poultry, but no ‘Roads’. However, with the boundary changes of 1994, part of Goswell Road in Islington became EC1 so technically it is now part part of the City, but it is not within The Square Mile. Thanks Ronnie – I do totally useless trivia ! A London EC post code does not indicate that the place is in the City.Fifty odd years ago when I was at school there Goswell Road and nearby City Road had EC1 postal addresses. Incidentally the Tower of London has an EC3 post code but is not in the City.